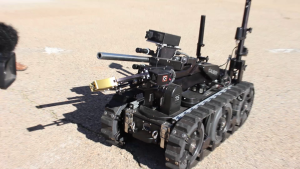 ST. GEORGE – First responders from across the county were treated to an explosive demonstration of the Washington County bomb squad in St. George Thursday. “Fire in the hole!” a bomb technician shouted three times before detonating a pair of explosives set up on the runway of the old St. George Municipal Airport at the Ridge Top Complex. Once the warning was given, the technician ignited the explosives and they safely detonated. Many of those gathered to watch the demonstration covered their ears as the loud blasts accompanied the twin-detonation that also produced a faint shock wave that passed through the crowd. The demonstration wrapped up a meeting of the Local Agency Planning Committee that meets at the old airport terminal, which has been converted into the Dixie Applied Technology College’s Emergency Response Training Center. Prior to the explosives demonstration, the LAPC met inside the training center for a presentation from Washington County Sheriff’s Lt. Nate Brooksby, commander of the Washington County bomb squad. 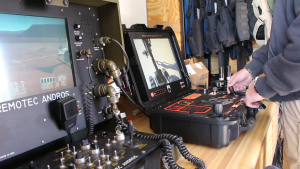 “Today, we just did an overview – explosives familiarization for first responders to ensure they have an understanding of what to look for if they come across either improvised explosive devices, commercial explosives or military-type explosives,” Brooksby said. 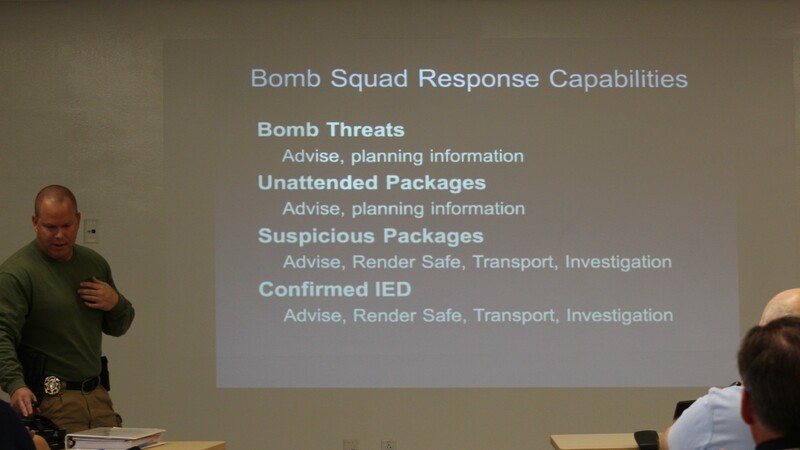 Currently, five bomb technicians make up the ranks of the Washington County bomb squad, Brooksby told the committee. 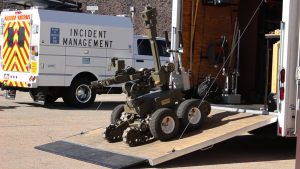 The squad is one of eight in Utah that collectively make up the Utah Bomb Squad Task Force. The Washington County bomb squad primarily serves the five-county area (Washington, Iron, Kane, Garfield and Beaver counties) but can respond anywhere is the state as needed, Brooksby said. Those in attendance were shown through photos and video clips how powerful certain explosives, even in limited quantity, can be, as they were shown footage of an explosion that demolished a car and then a freight truck filled with explosives that obliterated a city street in Ireland. Attendees were also shown the effects explosives – as well as the thermal shock waves they produce – have on the human body. The photos were not for the faint of heart and were shown at the end of the presentation, just before lunch was served. After lunch, the committee was taken outside and shown some of the tools at the bomb squad’s disposal. Among them is a pair of remote-controlled robots that allow the technicians to examine suspicious packages and, if necessary, detonate those packages. Determining what is inside those packages is done with the use of an X-ray device attached to the robots. They are also outfitted with radiological detectors, Brooksby said. 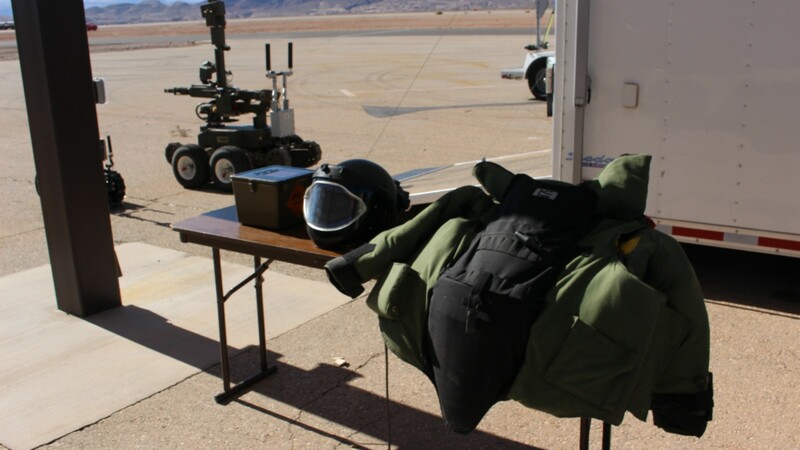 When the technicians have to physically handle suspected explosives, they use a large, padded suit composed of Kevlar and plates that protect from thermal blast pressure and fragmentation. Complete with a large, shielded helmet, the suit weighs around 75 pounds. If necessary, it can also be outfitted with a self-containment breathing apparatus. While the bomb squad responds to all sorts of suspicious packages – a suitcase or backpack left unattended or a box filled with wires and batteries – Brooksby said actual improvised explosive devices the bomb squad comes across tend to be pyrotechnic or gunpowder-based. These can be the results of people getting fireworks and tearing them down for uses they were not originally intended for, he said. As some bomb-making materials can be acquired at hardware stores and other commercial businesses, Brooksby said, the bomb squad has reached out to these businesses and helped educate employees to know what to look for. One particular item might not be suspicious, but when purchased with other items known to be used in improvised explosive devices, law enforcement would like a heads-up if it appears suspicious to employees. As for what people need to look out for in general, Brooksby said anything that is “out of place” is potentially suspect, like an unattended box at the St. George Temple or a backpack left at the 5th District Courthouse. People who are familiar with what does and doesn’t fit in at their places of employment and other locations they frequent have a far better idea of what may be out of place than a bomb technician would, Brooksby said. 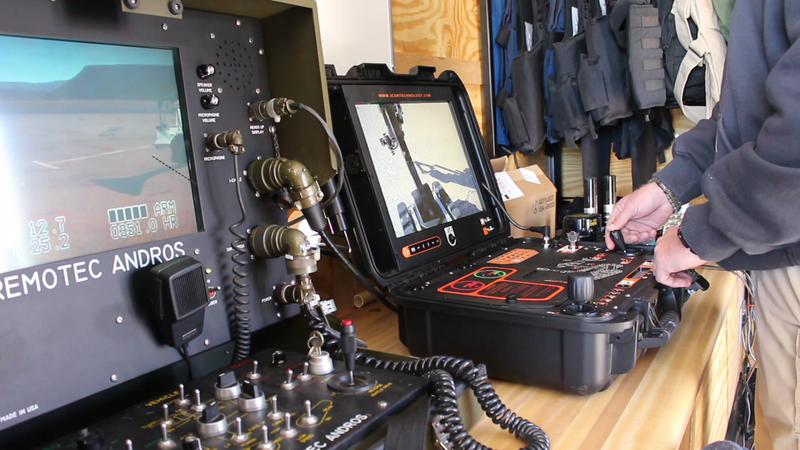 Last week, the eight squads of the Utah Bomb Squad Task Force met for a three-day exercise at the Ridge Top Complex, where they undertook a “large vehicle bomb counter measures course,” Brooksby said. Though nearby residents had been informed by the city that they would be hearing blasts coming from the old airport, others who lived below the hill and in the surrounding area had no idea what the “booms” they were hearing were. The mysterious booms resulted in the St. George Communications Center getting numerous phone calls from concerned citizens. Brooksby said the exercise was one of the sources of the booms heard in the area, adding he and others also heard booms coming from the west, though he said he wasn’t sure what the origin of the other blasts could have been at the time.